4 Bedroom Detached House For Sale in Sheffield for Guide Price £230,000. 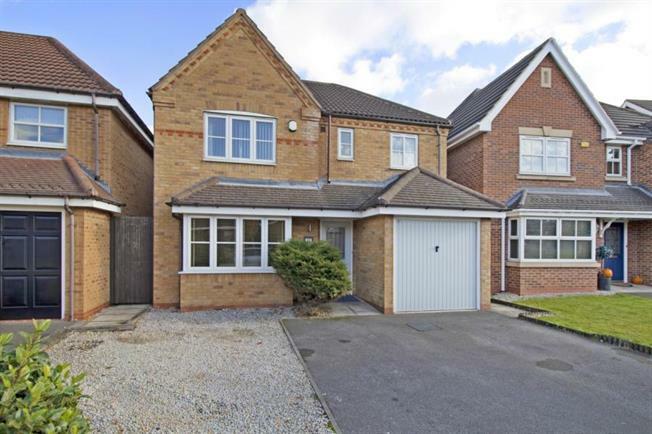 Situated on the sought after Heritage Park development in Renishaw, is this well appointed beautifully presented four bedroom detached family home. The property is well presented throughout and we strongly recommend an early inspection. In brief the accommodation comprises; The Entrance hall provides access to the Living Room with French doors providing access to the separate open plan dining room and modern fitted Kitchen. Further from the hallway is the Cloakroom/W.C. To the first floor the Master bedroom boasts an En-suite shower room, three further bedrooms and the family Bathroom. The property stands in well maintained gardens and has a generous driveway and hard standing providing parking for multiple vehicles and giving access to the integral Garage. To the rear is a fully enclosed landscaped garden with a covered decked entertaining area, summerhouse and laid to lawn. Renishaw is a popular suburb on the outskirts of Sheffield popular with commuters for its excellent M1 motorway links; there are excellent facilities and Schools in nearby Eckington and Renishaw Hall with its stunning gardens and events. Superb local amenities at Crystal Peaks Shopping Centre and Rother Valley Country Park.